After 13 Races and 110 horses entered, the top 10 fastest qualifiers are set for the final of The Ed Burke Million Futurity. There were some upsets, some gate scratches, some highs, some lows and some great racing. 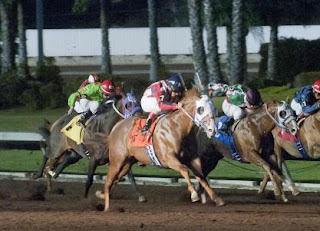 When all was said and done, the fastest qualifier is One Dashing Eagle (above, picture courtesy of LosAlamitos.com) who is owned by Jose M and Gustavo De La Torre and San Gregorio Racing Stable Inc. This 2 year-old son of One Famous Eagle covered the 350 yard distance in 17.555 and is trained by Eloy Navarro and ridden by Adrian Loza. The 10 finalists are worthy of a shot at the $1,041,000 Ed Burke Purse but there were plenty of more runners that did not get a chance to shine due to troubled trips and late scratches. I like what i saw in many of these runners and can assure you that the final will be wide open and provide great betting odds and not to mention that it should be a great 2 year-old season with this initial crop of runners. It was a good handicapping night for me with many top choices and some good profits on the night but losing the pick six by a nose still stings a little bit in what could have been a 4 or 5 figure score. Let's take a look at the ten runners that will be back for the final of Sunday June 24th.